It's hard to believe that the video games of today--the amazing graphics, interface, and stories--originally came from a place of low-tech. If you thought Nintendo was bad with its 8-bit imagery, I bet you'd be dumbfounded when it comes to the early graphics and games of the first mega-success home video game system, the Atari 2600. If you were a kid that grew up in the late '70s and early '80s, you spent a lot of time down at your local video arcade playing such machines as Donkey Kong, Pac-Man, or Q*bert. Or, if you were one of the lucky kids--your parents bought you an Atari 2600 in the heat of the Reagan era of trickle-down economics. Attention! You have just entered a battle zone! Forget games like Missile Commander, Defender, Pong, or Space Invaders--Combat was where it is at, and it all about killing each other. There was no story line to follow, no mazes to get through, Combat was all about killing each other. And in the heat of the cold war of the 1980's, kids had lots of aggression to resolve. To call Combat a version of Pong really does it no justice whatsoever. It was more than that. 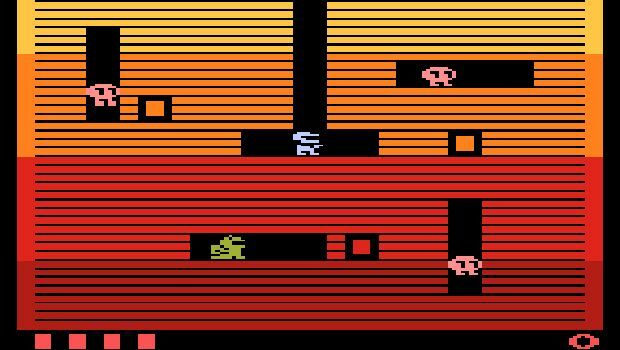 Originally, Combat started out in the arcade and then transitioned over and made available for Atari 2600. The premise of Combat? You got to be a tank, jet, or airplane and you were opposed against your co-player and the goal was simply to shoot each other. The unique aspect of Combat was that the shots you fired were limited to the screen in which you existed, but your actual plane wasn't. 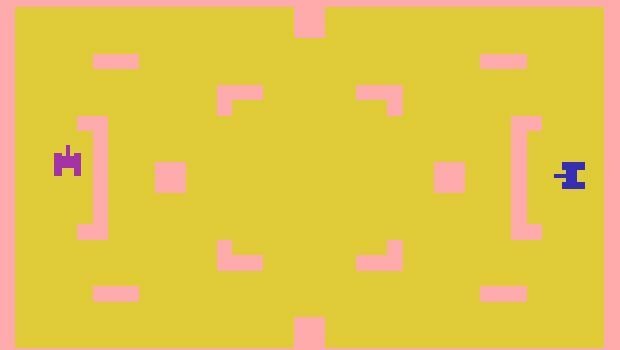 This meant that you could fly in a straight line from the left of the screen to the right, go through the wall, and then re-appear on the left side of the screen and do it all over again. But you shots, well, they'd bounce off the walls. It was basically like Mad Max Beyond The Thunderdome for airplanes, jets, and tanks. It was amazing. 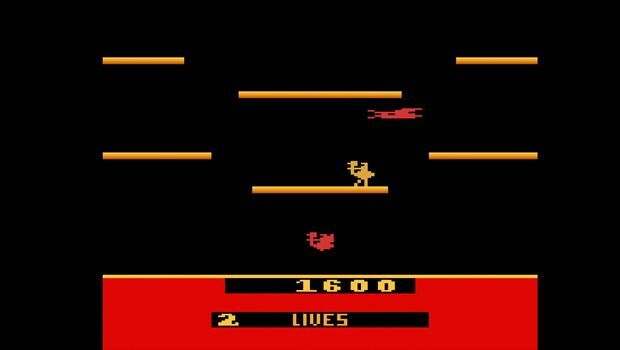 Perhaps, the weirdest game that was ever made for the arcade and then released for the Atari 2600, Joust was a game that featured yourself as a knight riding around on Donkey Kong-like levels on a giant ostrich-thing. You walked around or ran if you chose to, and gathered up these eggs--which gave you more life power. The more you ran the more power you lost, therefore, you needed the eggs in order to survive. You could jump and shoot opponents, and if you had two players in the game at one time you could run at the other (hence the name of the game) and knock them off the level. Oh yeah, and there were evil computer-generated knights that popped up too and attacked you. It was weird, but totally fun. Asteroids is likely one of the best known or games associates with the Atari 2600 home video gaming system and for good reason. It was totally crazy. Yet another game that first appeared in arcades around the country in the early '80s, Asteroids' premise was fairly simple. You are a space ship and asteroids are flying at you from all directions and you have to shoot them before they hit you. While the premise doesn't should that particularly exciting or fun, it was. Here's why: because of the utter lack of control you had over the spaceship when it was flying. You could shoot the asteroids, and sometimes you had to shoot them twice, because some, on a first shot, would split into two different asteroids, therefore affording your spaceship double the risk or being hit. Next, the space ship was horrible at moving around. You could move with ease in a 360 degree circle with no problems but the Atari 2600 joystick afforded you the ability to fly too, but once you started to fly it was impossible to fly in a straight line or to stop when you needed to. 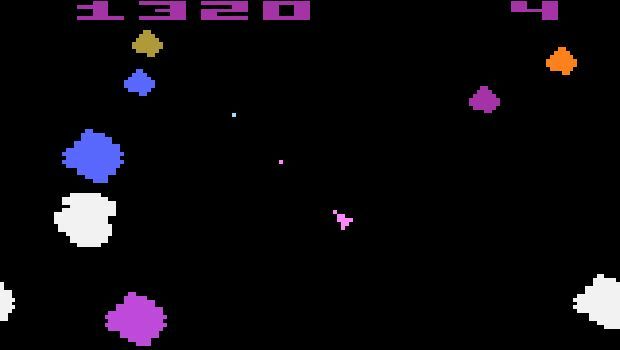 Therefore, anyone who was good at Asteroids generally never flew around the screen, they just floated in the middle turning around-and-around shooting everything in sight. 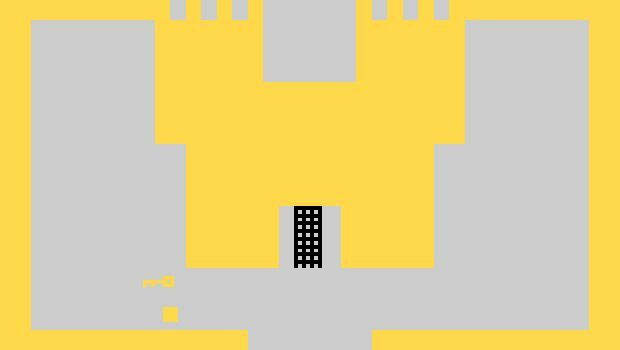 Not the worst of the graphics for the games of the Atari 2600 but right up there near the top for sure! Dig Dug featured a little miner that walked around underground digging tunnels and sitting bombs and traps for these weird Pac-Man Ghost rip-off monster characters that would chase him in the tunnels below the earth that he was digging. What made the game so damn addicting was because of how the Monster-Ghosts would be trapped in certain tunnels and if you had a good strategy you could dig a system of tunnels just underneath where all the Monster-Ghosts were trapped, and mind you, you only had a certain amount of time to do this because the Dig Dug Monster-Ghosts would magically un-trap themselves and move in toward you. If you managed to dig a system of tunnels and the Monster-Ghosts were standing in the right place at the right time--they would die at the same time and you would advance in the level. Yes, this is a lofty notion, isn't it? Adventure was The Legend of Zelda before The Legend of Zelda. Video game historians/fans credit Adventure as being the first action-adventure game to include a hidden feature. The premise of the game was painfully simply but incredibly addicting. The player had to journey through a series of screens, that at times, became very maze-like. On each screen there would be something hidden. The player would have to find things like a sword or a key, which would then have to be carried with them either forward or in reverse across the screens that were just traveled to unlocked certain things like a castle for example. The risky aspect of Adventure was that you would encounter dragons that would attack you and if you didn't have the weapon you needed you've effectively had to re-trace your steps and visit the other screens to find what you had initially overlooked. And if you were lazy about it, the dragon that you left would follow you sometimes, so you really had to have your wits about you, otherwise you were a dead man. Spoiler Alert: Once you got to the end of the screens you had to find something special and then carry it all the way back through all the screens that you had previously visited to deliver it. From there you would win the game.